Lincoln County Line is another of the VLS themed lines, this one offering a large range of 'Budget' figures. Although this line is supposed to be a discount line, I can't really see why it's labelled as such, since the quality of the figures appears to be the same as other VLS creations.............maybe somebody will enlighten us? This set consists of two standing figures. One of the figures is an officer, who is shaking hands as if congratulating a wounded soldier. The officer is wearing a long fur-lined overcaot and peaked cap, the injured soldier is wearing a fur-lined parka and has his left arm in a sling. The injured soldier also wears a balaclava under a side cap. Moulding is well done, particularly on the torso of the soldier, all the extra equipment, such as the pistol holster and map case for the officer, and canteen, water bottle and bread bag for the soldier are moulded separately, and although there is a little flash, there's nothing that isn't easily cleaned up. The sculpting of the heads is not brilliant, and they're probably best replaced if you want a really top-notch figure, as they're a little 'lumpy', but otherwise, a great pair of figures. A great pair of figures that will look great just standing by a vehicle to add that little bit of interest to your next build. Recommended, and keep an eye out for these two being used in a ful build in the near future. Lincoln County Line is a VLS creation offering a discount line of some unusual figures. 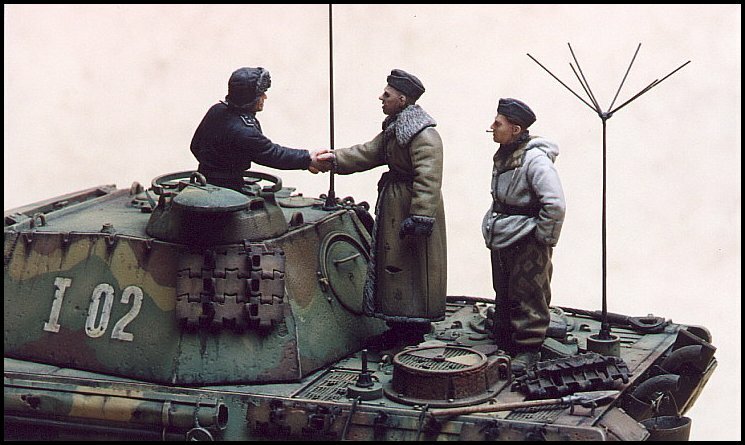 This pair, dressed for cold weather on the Eastern front, will look great simple standing in front of a vehicle or a part of a larger scene. A little flash to remove, and the heads are best replaced, but interesting none the less. Our Thanks to Lincoln County Line (VLS)! Very interesting, probably inspired by this beatiful pair done by Mirko Bayerl (taken from Missing Lynx page). R.